I’d wanted to visit the Fusiliers Museum at Bury before I gave my Ted Hughes paper last month. This is because Ted’s father had served with the 1st/5th Lancashire Fusiliers at Gallipoli, and later in France. The regiment was based in Bury, which was William Hughes’s home town. I didn’t manage it then, but finally got to Bury yesterday. the museum is well worth seeing, with a good display about Gallipoli, including a short film and the painting above. 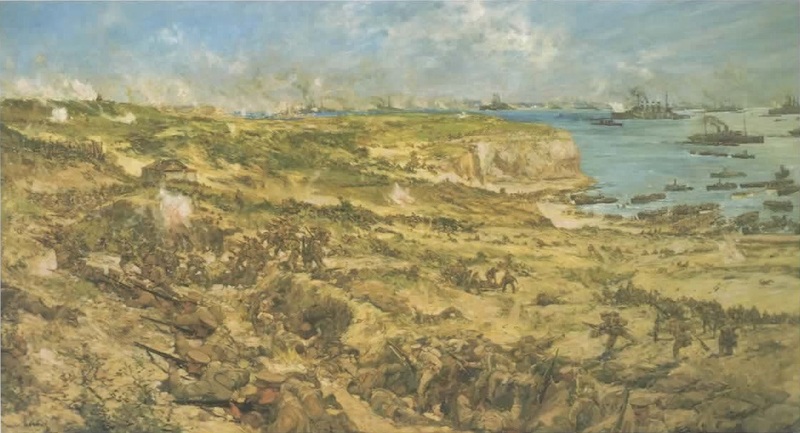 The original is very large, and shows the landing of the 1st Battalion of the Lancashire Fusiliers landing at Gallipoli on 25th April, 1915. It is by Charles Dixon (1872-1934), a well-known painter of maritime subjects, here lending his talents to the war effort. He was not at Gallipoli, so far as I can make out, but would have based his picture on first-hand accounts, presumably. This entry was written by George Simmers and posted on July 20, 2017 at 2:22 pm and filed under War Artists with tags 1st/5th Lancashire Fusiliers, Bury, Charles Dixon, Fusiliers Museum, Gallipoli. Bookmark the permalink. Follow any comments here with the RSS feed for this post. Post a comment or leave a trackback: Trackback URL. Thanks for this – would love to go to Bury to see it. My grandfather fought at Gallipoli and in France too. This is a detail from L’Enfer by Georges Leroux. 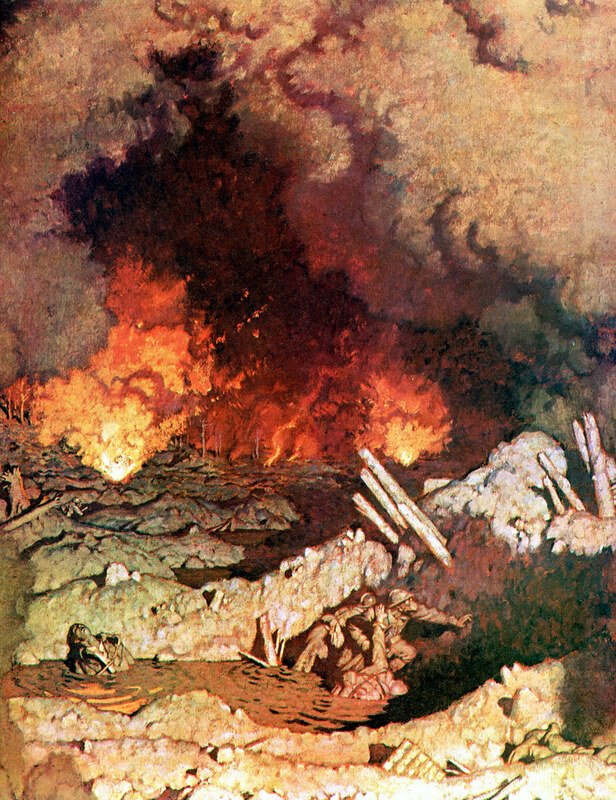 It was the double spread starting page of “Life” magazine’s 50th anniversary series on the Great War. 50 years later, it’s still a hammer blow.